The second principal season of registration is underway. If you have not yet configured the 2015-2016 Season for registration, below are the basic instructions for configuring your season. All seasons are configured in the same way. So if you have configured an off-season or the prior principal season, you’ll fly right through this process. Please note, if this is your first season as a Cal North affiliated league, you must first configure your play levels before continuing with the instructions below. Please contact Emanuel Lusca in the Cal North office if you need assistance in doing so. You can also refer to the play level configuration instructions detailed in this post regarding configuring the off-season play level. A) At the league level (this step must first be completed by a league registrar) click on Season to display the list of seasons that are available. The check mark indicates that configurations have been selected within that season. B) Expand the 2015/2016 Principal Season and select the age groups that should be available for registration. Under Show Application Types, check off both Coach/Admin and Players. C) Your season must be configured at both the League and the Club levels. 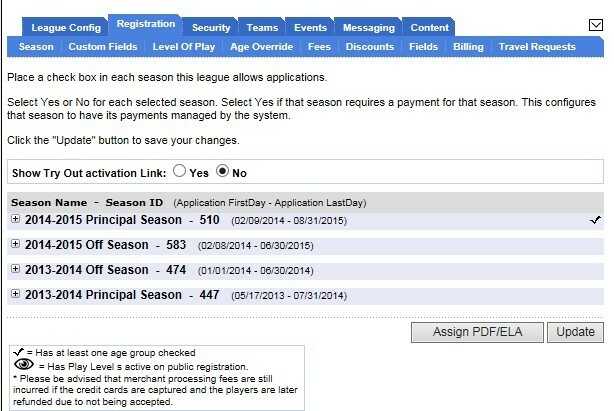 So after configuring at the league level, narrow down to your club(s) and configure the season at the club level. If you are a club registrar, and your league registrar has already configured at the league level, you may have the permission (depending on your level of access) to configure your season for your club. NOTE: All Leagues have default 01 club and, even though there might be no players registered to this club, the season still needs to be configured for the club.